The idea is simple enough: A home theater provides a theater-like experience in your home. But what exactly does that entail? The quick answer is, there's no quick answer. A home theater can be as simple as a few AV devices in your living room or as complex as a completely renovated basement designed to look like Hollywood's El Capitan Theater. At its core, a home theater system should provide a high-quality video experience and an immersive audio experience that breathe life into your favorite movies, but a number of roads can lead to that destination. This primer offers a general overview of the basic home theater ingredients--from the AV equipment to the seating to the other room elements that can shape your perfect home theater. When you envision a theater-like video experience, you probably think first of a projection system and a very large screen. That's certainly the display of choice in the prototypical home theater. The two-piece projector/screen combination is generally best suited for a dedicated theater room in which you can completely control the lighting, although many manufacturers now offer high-brightness projectors and ambient-light-rejecting screens that are specifically designed for use in brighter environments). Companies like SIM2, Barco, and Digital Projection International offer projectors and services targeted more at the high-end marketplace, around $20,000 and above. However, projectors aren't reserved solely for the wealthy. This type of display device can actually offer the best screen-size-to-cost ratio. Companies like JVC, Sony, Optoma, and Epson offer high-quality mid-level and entry-level projectors. As for the projection screen, you can choose between fixed-frame, pull-up/-down, or motorized screens, and most screen manufacturers offer a wide variety of screen materials to suit different projectors and environments. You also need to think about what screen shape you want: Do you want a standard 16:9 screen that's perfect for HDTV and many movies or a 2.35:1 screen that lets you watch CinemaScope movies with no black bars (this requires a suitably equipped projector and sometimes an add-on lens). Another option is to add a masking system that uses drapes or panels to tailor the screen shape to suit each source. Some of the top names in home theater screens are Stewart Filmscreen, Screen Innovations, dnp, Da-Lite, Vutec, and Elite Screens. Of course, the two-piece projection system isn't the only option in the display realm. Flat-panel TVs are pretty much the driving force in the home entertainment marketplace; and, thanks to constantly falling prices, you can now get a much bigger screen for your money. Whether you invest top dollar in a 75-inch-plus panel or go with a more modest 50-inch screen, the flat-panel HDTV can still make a great foundation for a home theater system, and the benefit is that you can watch it in all kinds of lighting conditions. Over the years, several different TV technologies have competed for consumer dollars. In the past, most reviewers would point you to plasma HDTVs, like those offered by Panasonic and Pioneer, to get the best home theater performance--that is, the deepest black level and highest contrast ratio to create a rich image in a dark, theater-like environment. Of course, plasma panels are no longer in production. The most popular flat-panel technology these days LCD, which was once considered a bright-room-only technology but has made great strides in performance. Technologies like full array local dimming via LEDs instead of CFLs and 120Hz/240Hz refresh rates have helped overcome limitations in black level and motion blur, respectively. All of the big names in LCD--including Samsung, Sony, Vizio, and LG--now incorporate these performance-improving features. OLED is another flat-panel TV technology that has recently replaced plasma as the videophile's choice. Like a plasma TV, an OLED TV's pixels generate their own light, so the TV is capable of a much deeper black level than an LED/LCD TV. 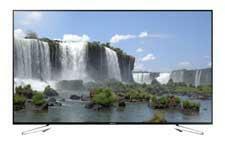 An OLED TV also can be much brighter than a plasma, so in many respects it offers the best of both worlds. Thus far, OLED has proved difficult to reliably mass-produce, so companies like Samsung have backed away from it, at least in the short term. LG is currently the only company manufacturing OLED panels for TVs in the United States; in fact, they make the panels found in Sony's OLED displays. Two current trends in the TV world are: 1) smart TVs that connect to your home network and stream AV services like Netflix, Hulu, and Spotify; and 2) Ultra HD or 4K TV, which offers four times the resolution of 1080p and can include advanced technologies like High Dynamic Range and a Wide Color Gamut. The other main element that makes a trip to the movie theater so memorable is the enveloping audio, in which sound elements come at you from all directions. 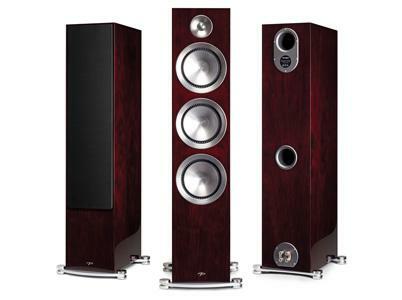 At home, the most basic surround sound speaker system consists of 5.1 channels. The "5" stands for speakers in the front left, center, front right, rear right, and rear left positions, while the ".1" belongs to a subwoofer that helps flesh out the bass for explosions and other low-end effects. Some home theater installers recommend the use of multiple subwoofers to help deliver smoother bass response across a wider listening area. It's also popular to go with a seven-channel speaker system, which uses two side-channel and two rear-channel speakers for a more complete surround experience. The latest trend is 3D (or object-based) audio, in which formats like Dolby Atmos and DTS:X add an overhead sound element that provides an even more immersive audio experience. Speakers come in all shapes and sizes, from freestanding towers to bookshelf models to thin speakers that mount on or in the wall. It's easier than ever before to find speakers that are low in profile but high on performance--through companies like Definitive Technology, Paradigm, GoldenEar Technology, and many more. The general rule of thumb is, the smaller the speakers, the more important it becomes to add a subwoofer to help fill in the low end. If you're building a dedicated theater room, you have more freedom to pick the exact speakers you want, regardless of size or aesthetic, and to position them in the ideal positions to get the best performance. If, on the other hand, you're trying to incorporate your home theater system into an existing living or family room, you might not have as much flexibility to position freestanding speakers in their ideal configuration. Or perhaps you (or your significant other) just don't like the idea of cluttering the room with speakers. In that case, in-wall or in-ceiling speakers may be just what the home theater fan ordered. SpeakerCraft, Sonance, Polk Audio, and Atlantic Technology are just a few companies that offer high-performing in-wall/in-ceiling models at many price points. In-wall subwoofers are also available. If you like the idea of surround sound but simply can't find a way to practically integrate a multichannel speaker system into your room, the soundbar has become a popular solution. A soundbar incorporates multiple speaker channels into a single speaker bar that mounts above or below your TV. These devices often use pyschoacoustic manipulation to create a sense of surround envelopment, sometimes through digital sound processing and sometimes by bouncing the sound off the walls (and sometimes both). This solution generally doesn't offer the precise effects placement and higher-end performance you can get from separate speakers, but it's a good small-room or apartment solution. It's also a great option for somebody who is unhappy with the quality of their TV speakers and wants an upgrade in sound quality, a common issue with flat-panel TVs. Polk Audio offers some great soundbar solutions, as do Vizio, Yamaha, Zvox, and Definitive Technology. The electronics are the brain of the home theater system. They receive the audio and video signals from your source devices and distribute them out to the speakers and display device. (Some video enthusiasts prefer to only feed audio through their electronics and send video directly from the sources to the display.) Electronics fall into two main categories: AV receivers and separates. 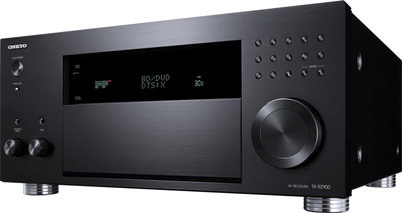 An AV receiver puts everything you need in one chassis: One box contains all of the AV inputs to connect your devices, the processors that decode the audio and video signals for output, and the amplification that powers the speakers. Some popular receiver manufacturers are Denon, Marantz, Yamaha, Onkyo, and Pioneer. As the name suggests, the "separates" approach requires two boxes: a preamp/processor for signal input/processing and an amplifier (or multiple amplifiers) to power the speakers. The latter approach is more common amongst high-end audio enthusiasts who want more precise control over their system's performance, particularly in the amplification realm. Anthem, McIntosh Labs, Mark Levinson, Classe Audio, and Simaudio are examples of companies that offer high-end separates. Whether you opt for a receiver or separates, when shopping for electronics, you want to make sure that the product has enough inputs for all of your source devices, with a few extra to accommodate anything new you might buy. HDMI is currently the AV connection of choice for most source devices, so you need to make sure the unit has enough HDMI inputs. Also, make sure an AV receiver or amplifier has enough channels to handle the number of speakers you want to use, be it five, seven, or more. Even if you only plan to use a 5.1-channel speaker system, you might want a 7.1-channel receiver to accommodate future upgrades or perhaps to use the extra amp channels to power a pair of stereo speakers in another room. Finally, if you have any plans to invest in a UHD Blu-ray player or media server, you should buy a receiver or preamp/processor that can decode the best high-resolution audio formats, like Dolby TrueHD and DTS-HD Master Audio. If you want to enjoy 3D audio formats like Dolby Atmos and DTS:X, you need to make sure your AV processor has those decoders, as well. The principal source device in any home theater system will be some type of movie player. The trusy old Blu-ray player is still an excellent choice to serve up a good-looking 1080p image and enveloping surround sound; however, if you want better picture and sound, then an Ultra HD Blu-ray format is the way to go. In addition to offering a full Ultra HD (aka 4K) video signal, UHD Blu-ray players can output high-resolution audio formats like Dolby TrueHD and DTS-HD Master Audio that can make the most of your high-quality surround sound system. (Check out Five Tips to Setting Up Your Blu-ray Player.) If you own a 3D-capable display device, you may want a 3D-capable Blu-ray player to enjoy 3D movies at home. If you have a fairly extensive movie collection, you might consider a video server that can store your movies in digital form, allowing for easy searches, quick start-up, and convenient access to cover art and other info. Kaleidescape is a major name in video servers. Of course, the cable/satellite box is another common source device. A whole new crop of streaming video players from the likes of Apple, Roku, and Amazon allow you to stream video-on-demand over a network connection. Finally, gaming consoles have become a popular home theater source, as products like the PlayStation 4 Pro and the Xbox One support HD and UHD streaming video. Okay, the basic video and audio elements are in place. Now it's time to accessorize. Again, if you're adding a home theater system to an existing room, you may not have the flexibility to incorporate new seating, lighting, or other HT elements; but at the least, you might consider a new equipment rack, TV stand, or TV mount from a manufacturer like Omnimount, Sanus Systems, Bell'O, Premier Mounts, or BDI. For those who are lucky enough to be creating a dedicated home theater space, the possibilities are endless. Seating will have a huge influence on the overall comfort and appeal of your home theater, so choose wisely. There's certainly no shortage of options, both in traditional theater seating and unique designs from companies like Fortress Seating or PremiereHTS. What's more theater-like than a lighting system that automatically dims when you press your controller's Watch Movie command. With products from Lutron, Leviton, or Vantage, you can create a dedicated home theater lighting system or include HT lights as part of a wholehouse lighting system. To bring out the very best in your audio system, consider the use of acoustic treatment to help tame reflections and correct any other anomalies that your room design might create. Many professional installers offer advanced acoustic calibration, in which they measure the system's audio characteristics and place acoustic products (diffusers, absorbers, bass traps) exactly where they're needed in the room. Visit the Auralex Acoustics website to see some examples of acoustic treatment products. Once you've assembled all the different home theater elements, you'll probably want to invest in a universal remote to control them all...that is, unless you enjoy having to use five different remotes just to cue up a movie. A well-selected, well-programmed remote can make life easier for every viewer in the house. If you have a modest home theater system, you might get by with an entry-level universal remote that controls only a handful of devices and has limited or no flexibility to tailor buttons to your personal needs. 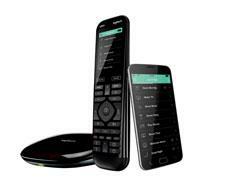 Mid-level remotes from companies like Logitech/Harmony can accommodate more devices and offer more flexibility. These products often sport customizable touchscreens and use computer software programs for easy do-it-yourself programming. If we're talking about a high-end home theater that incorporates AV gear, lighting, HVAC control, screen masking, and other automation, then you might need to move into the realm of advanced system control, with a product from Crestron, RTI, or Control4. These advanced system controllers are sold exclusively through custom installation channels and should be programmed by trained installers.